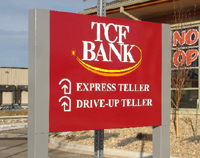 Pan channel letters are becoming the most popular form of electric signs advertising. Outdoor business signs are an extremely important form of advertising. 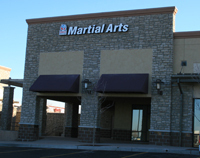 If you are in a strip mall, channel letters may be required by your landlord or property management company. 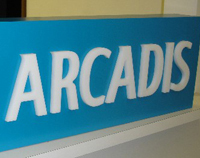 Lighted letter signs are an excellent way to attract business. All of our Signs designed in Charlotte NC. Kranken Signs Vehicle Wraps is a manufacturer of electric signs. Located in Charlotte NC. We are lighting up the night. .
Post and Panel signs are non-illuminated signs made from aluminum. Way-finding signs are an excellent way to control your traffic for bank signs, hospital signs, university signs, church signs, drive-up window signs, and fast food restaurant signs. We also make vinyl signs and banners. 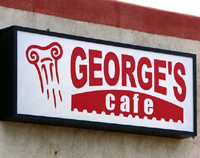 We are committed to giving our clients the best possible service, using the finest materials, and with the highest quality installation at the most affordable rate possible.We guarantee that we will match any verifiable competitor’s quote on similar electric signs In addition, we will beat that quote providing even more value for your marketing dollar. Our Yard Signs Charlotte NC and Outdoor Signs Charlotte NC are the best that money can buy, and we are confident that our product is right for your business. For that reason, we offer our low price guarantee – so that there is no doubt we have only the best in mind when it comes to our client’s needs. Call 704-588-2555 for more information on our best price guarantee and how we can get started today on your signs and banners Charlotte NC.